Although the annual holiday season and all the celebration is now over, and all the partying and drinking that usually goes with it, it’s also a good time to reflect on the perennial scourge of Okinawa, drinking and driving. In Japan, police set up extra drunk driving patrols and checkpoints on the roads several times a year in campaigns to catch offenders before lives are forever and often tragically, changed. The Okinawa Prefecture has a reputation of being the worst in the nation for driving under the influence. This could be mostly due to the more laid back island mentality that heralds back 50 or more years, when Okinawa was mostly farm land and if you veered off of the road, your biggest offense would have been flattening a section of your neighbors sugar cane field. Alas, a lot has changed since the ‘good ol’ days’ and Okinawa is no longer an expanse of farmland, but rather a busy metropolis, inclusive of a stoplight every 100 meters. Anyone who has driven on Route 330 or 75 knows that it’s a challenging task to bob and weave through the dense traffic and parked cars while sober, and extremely dangerous to try to navigate while drunk. If you are caught drinking and driving once, you will lose your driving license immediately and be detained by the police. After a court hearing you will be given a minimum fine of ¥300,000, and if you cannot pay this fine, you will have to work off the debt at a rate of ¥5,000 per day until the full amount is paid. 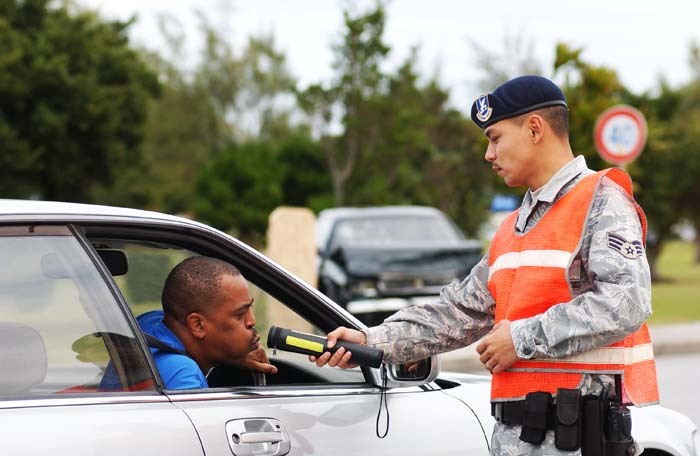 The above consequences are bestowed upon the lucky offender who had not done any damage to person or property while driving under the influence. The laws in Japan for drunk driving are clear as water. If your blood alcohol content is .03%, then you are considered impaired to drive. Put it this way, if you consume one beer, you now have .03% blood alcohol, and it takes roughly an hour and half for your body to metabolize that drink before you are able to drive again. In comparison to the rest of the world, the Japanese laws for drinking and driving are extremely strict. For instance, in countries such as Canada & some states in the USA, the level is .08% blood alcohol and that is about as lenient as it gets in the world. This is the equivalent to about 1-2 drinks, which is a very generous allowance. In Japan there are so many transportation options that there really is no need for driving impaired. One of my favorite ways to avoid drinking and driving is to skateboard to the drinking event. It is extremely fun and keeps you fit. Usually by the time you arrive home, you feel sober and invigorated from the winding post drinking adventure. If you decide to wear high heels, then taking a taxi is very affordable, and if you drove to the event and don’t want to leave your car overnight, you can hire a ‘Daiko.‘ The Daiko service will arrive to pick you up with two drivers, one to safely drive your vehicle and the other to drive you home, while you rest up for the long walk up your doorstep and finally to your bed. This is a great alternative to a taxi and the service is reasonably priced. The next time you head out for an event and you know that you will probably have some drinks, take the time to think about how your night is going to end. Is it best to grab the skateboard? A taxi or Daiko service? Or even head out on foot? Being caught for drinking and driving is a life-altering event that will destroy everything that you have worked hard to establish, never mind the lives that will be forever changed if you do cause an accident. In the case that this accident is fatal, your life will be haunted forever. Think twice and when on Okinawa, never drink and drive.